Jennifer started Chen style tai chi in 2011, studying with Richard Northwood. She completed the 11-step and 18-step short forms and moved on to the New Frame (Xinjia) and old frame (Laojia) and weapon forms, the sword being a particular favourite. She has also studied with Grandmaster Liming Yue in Manchester, seeking to expand and deepen her knowledge of both tai chi and qigong. In 2013 she achieved her Level 2 teaching certificate endorsed by Grandmaster Liming Yue. 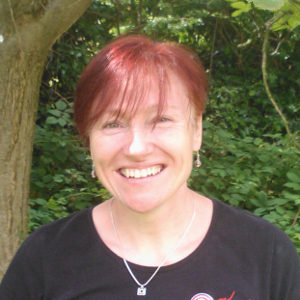 She teaches classes in Cheshire and in 2016 took part in the successful Parklives programme, teaching tai chi and qigong in parks in Stoke-on -Trent. She has also delivered taster sessions for companies wishing to improve the health and wellbeing of their employees. In 2017 Jennifer achieved a long-held ambition to travel to China and train with Grandmaster Chen Zhengleia and experience tai chi in the place of its origin. She also led a group tai chi performance for an audience of 1200 people which was broadcast on Chinese television. Jennifer has also studied mindfulness meditation with Bangor University, and is committed to the exploration of consciousness. Jennifer believes that starting Tai Chi is one of the best things she has ever done, bringing many positive changes to her physical and mental well-being. It is now a lifelong commitment. Through her teaching with Red Spiral, she shares her knowledge and experience of the potential life-changing benefits of Tai Chi and qigong with her students. While living in Manchester, Richard was introduced to Tai Chi by a work colleague in 1997. He then decided to search for a teacher, and discovered Grandmaster Liming Yue. Before long, Richard was travelling to China to exchange skill at Grandmaster Chen Zhenglei's First International Tai Chi Seminar. In 1999, Richard was endorsed by Grandmaster Chen Zhenglei as an advanced Xinjia practitioner at the first International Taijiquan meeting in Handan China. In 2000, Richard once again travelled to the People’s Republic of China to attain the Zhau Zuo International Meeting of Taijiquan Teacher's Certificate from Master Zhang Dongwu. Richard has taught Tai Chi extensively, both in the private and public sectors, with some of his students becoming teachers and competition medal winners in their own right. Under the tutelage of Grandmaster Liming Yue, Richard is a Senior Indoor Student. He is committed to the promotion and participation of martial arts for health and personal growth. Traditional Chen Style Tai Chi - learn balance, harmony, control and power with this excellent martial art. Click Here to open last years brochure. Learn to build a small oasis of calm in your mind. Practical classes that are free of the mysticism that inhibits understanding of these powerful and effective techniques.